The buzz about the royal wedding seemed to be all about the dress. It is amazing to me that they were able to keep the dress so under wraps. 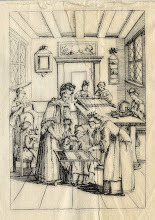 A lace that was hand-made by the Royal School of Needlework, based at the Hampton Court Palace. The lace was hand-stitched using the Carrickmacross lace-making technique, originating in Ireland. 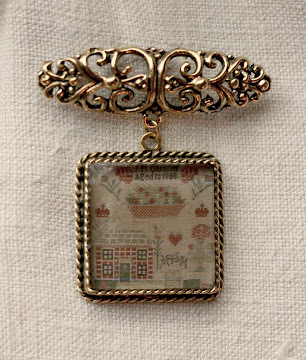 This lace making technique dates back to the 1800's. Roses, thistle, daffodil and shamrocks were hand-cut from lace and sewn onto ivory silk tulle. The lace-makers making Kate's lace were asked to wash their hands every 30 minutes and needles changed out every three minutes as to not mark the color. 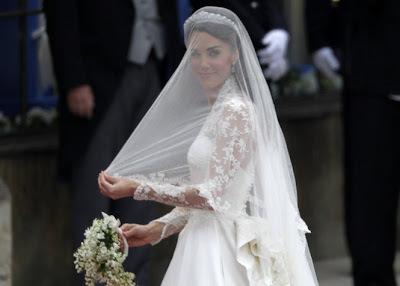 Kate also wore three petticoats of this hand embroidered lace, even her shoes were embroidered at the RSN. I'm hoping we get to see pictures of her shoes...I've been on the hunt but without any luck. Have any of you seen her shoes? Brenda here again, posting later in the day in regards to the above question. 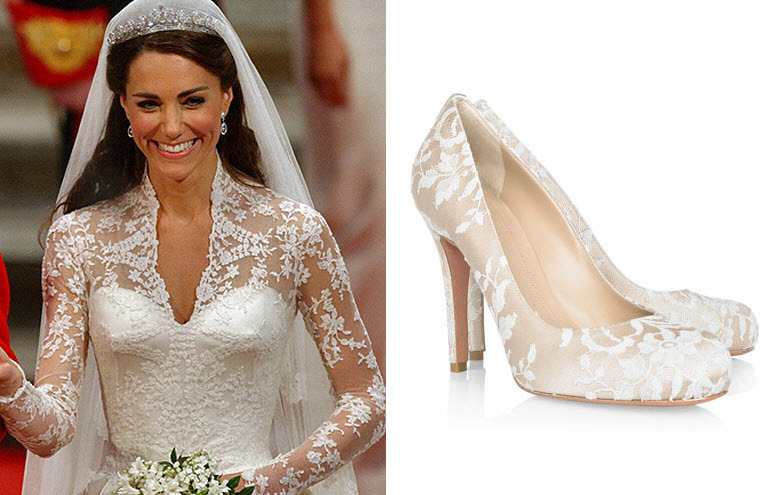 Thank you Hesztia for sharing this photo, here are Kate's shoes! Look alikes can be purchase for just a mere $995.00! And one more thing...Kate did her own make-up! A royal day to remembered that is for sure. 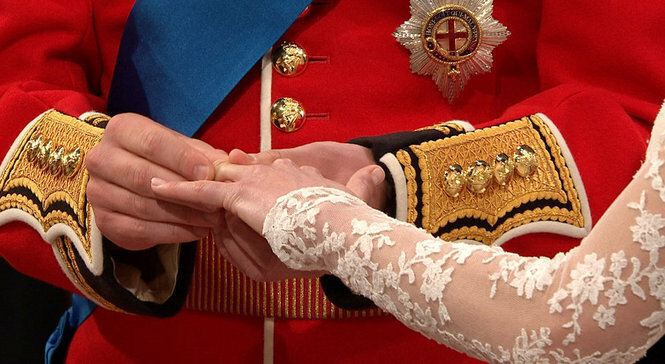 A couple of my favorite moments were when Prince William and Harry were at the alter and Harry turned around and looked at Kate and then whispered something to his brother. And the getaway, when William and Kate took off on their own, in his fathers old car, complete with balloons and streamers. A couple of moments that probably ruffled their Queen Grandmother's feathers...don't you think? What was your favorite memories of this royal event? Welcome to week 2 of the Soar SAL! Before beginning here I'd like to let all my followers & customers, from the south that have been affected by the horrific tornadoes, that you are in our thoughts and prayers. 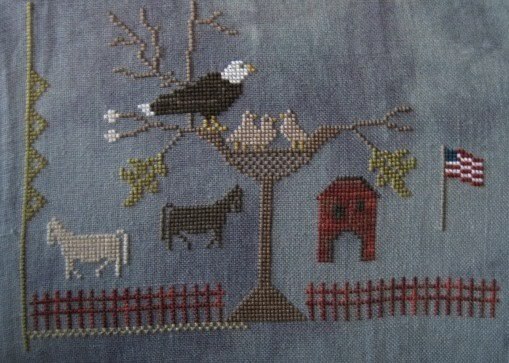 One of my cross stitch model stitchers, April (who most recently stitched my Bunny & Co. pattern) lives in Alabama. I received word from her late yesterday that they are okay. They have friends who have lost their homes, but thankful that no loss of life of family or friends for April. 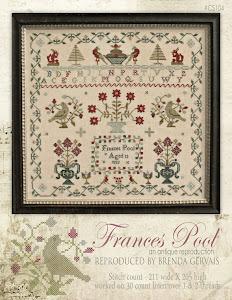 We welcome 4 new stitchers to this weeks progress...welcome Connie, Pat, Sharon & Teena! The above is Connie's piece. 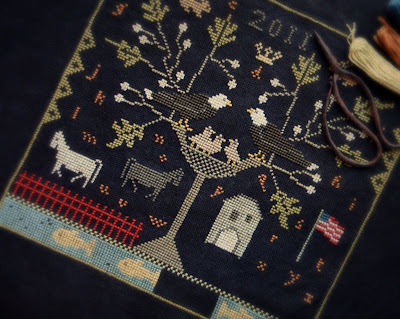 Connie started her sampler on April 19th. Due to the tornadoes in Arkansas last week, she was unable to send us her photo last week. Connie is working her piece on 30 count Weeks, color - Beige. She is using an assortment of flosses from her stash. Cappuccino (WDW) instead of DMC 644. 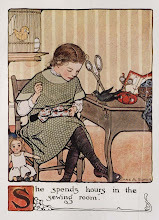 She is stitching over 2 threads using 2 strands. You can visit Pat over at her blog right here. The above photo is from Sharon. 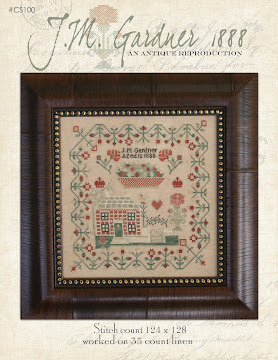 Sharon is using a 36 count linen, color Picture this Plus Barnwood. She is using 1 strand of floss in the suggested DMC flosses. I'm not certain if Sharon is working over 1 or 2 strands. Let us know Sharon, inquiring minds want to know! 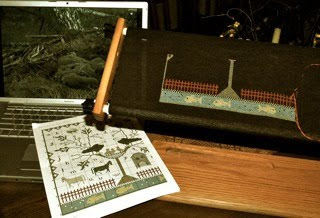 Above we have Teena's sampler in progress. She is late in joining in as she was on a mission to locate herself some of the black linen and she found it! Her daughters kindergarten class is enjoying watching the eagle cam as well. 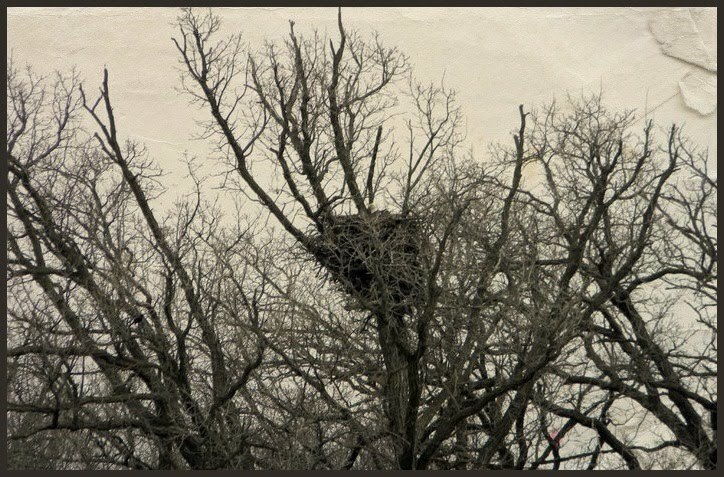 She lives near an eagles nest but never knew what happened way up in the tree top! 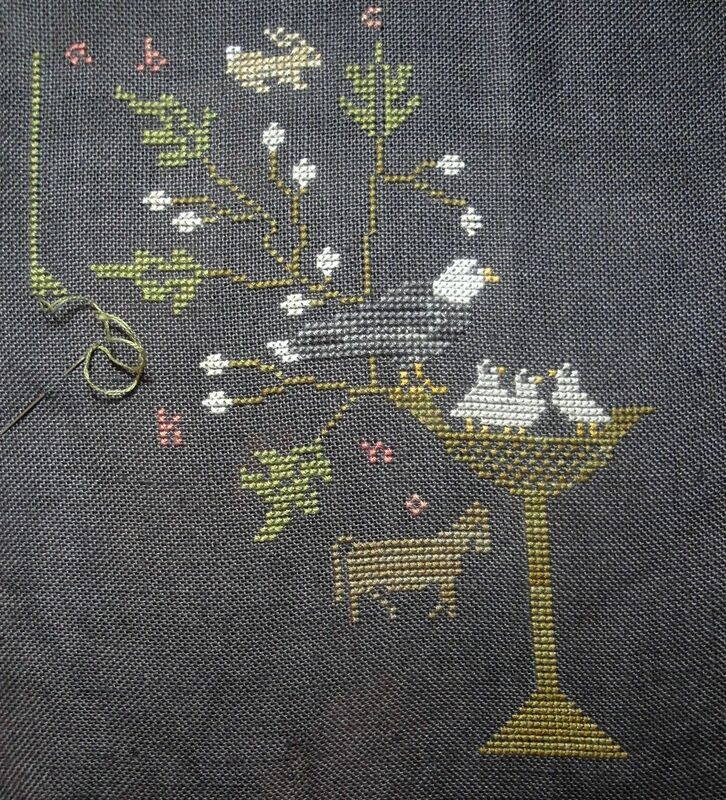 The above photo is from Harriet, she is joining us again with her weeks progress of stitching. 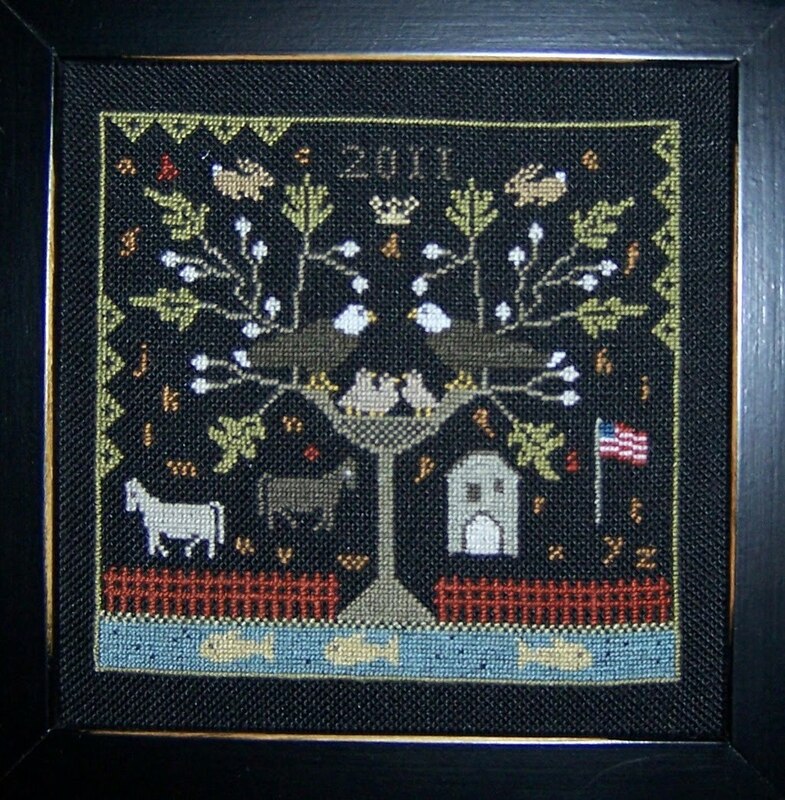 She had a gathering of stitching friends at her home recently and her guest enjoyed seeing her Soar sampler. And we have a finish! Bonnie is finished with her sampler and has chosen a black frame for her finishing touch. 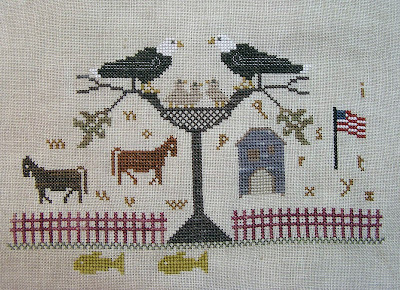 If you look closely you will note that three of the letters in the alphabet are stitched in a different color of floss. 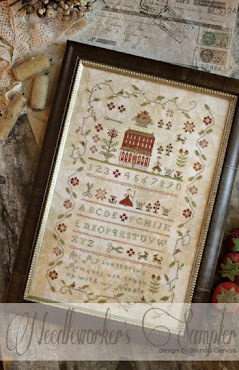 Bonnie chose to select her three initials and stitch them in red...a nice and personal touch to her piece. The above photo shows Paula's progress. She wasn't sure of the linen color in last weeks posting. She would like to clarify that it is Green Slate. 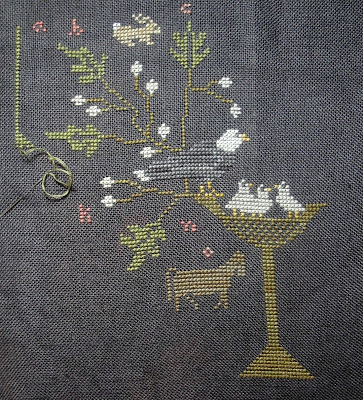 Above is Judy's WIP. She has made one color substitution since last week, substituting DMC 300 for DMC 3023. She is a blogger, be sure to visit her here. Be sure to scroll down atad on Judy's blog...even her kitty is enjoying the eagle cam!! Here is Barbara's update. 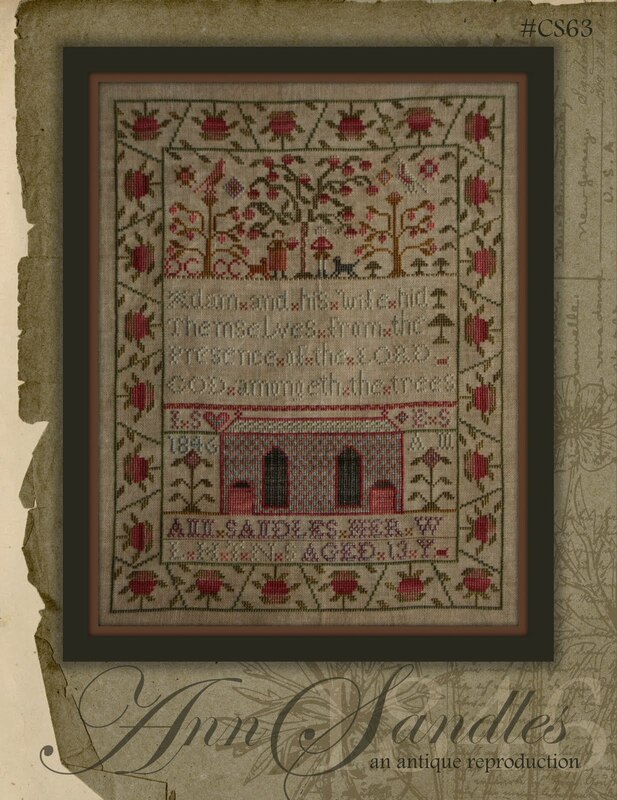 She says she finds it slow going on dark linen, so she didn't get much done as she would have liked to. 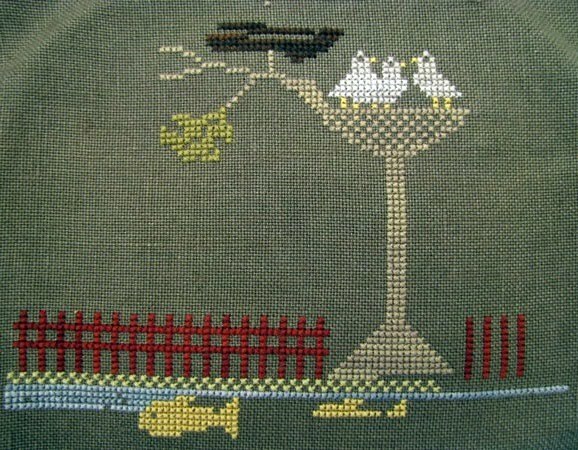 She was hoping to watch the Royal Wedding with stitching in hand. 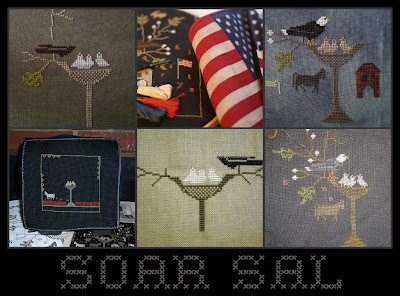 And lastly, the above photo is my work in progress of the Soar Sampler. 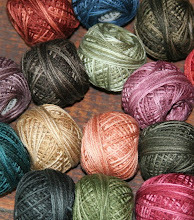 I am working on the 30 count Onyx linen by Weeks Dye Works, using all of the suggested DMC flosses as listed in the pattern. With just a bit of the stream left and one side of the fence, I'm hoping to have a finish perhaps for next weeks posting. 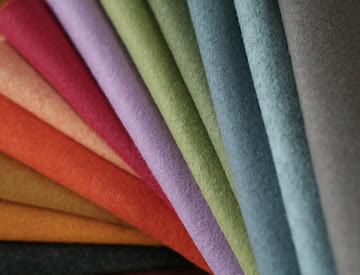 For those of you who have inquired about the 30 count Onyx linen, our shipment arrived yesterday. We have a limited supply, so if you are holding out on starting your sampler for the availability of the linen, it is now available for purchase on our website. It is located under the NEW ITEMS category. I'd like to thank all of the SOAR SAL participants! 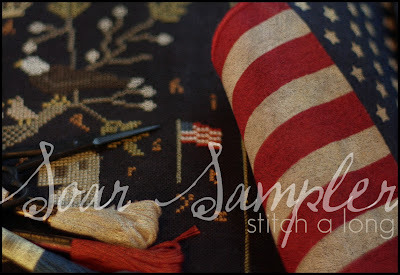 It has been fun seeing each of your own samplers with your own personal touches take shape. Once again, we will post pictures again next Friday. 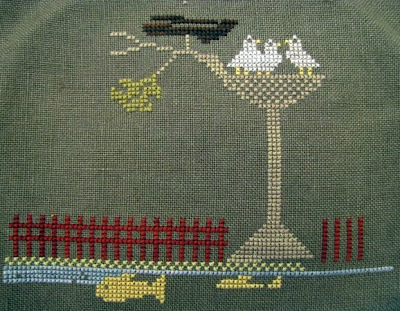 If you haven't joined in, please do so...you are all welcome to join in on this stitching fun. 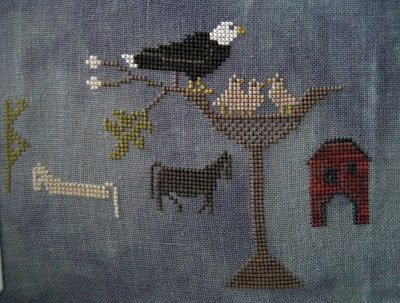 I must admit, the SAL is pushing me to get mine finished in a timely fashion. 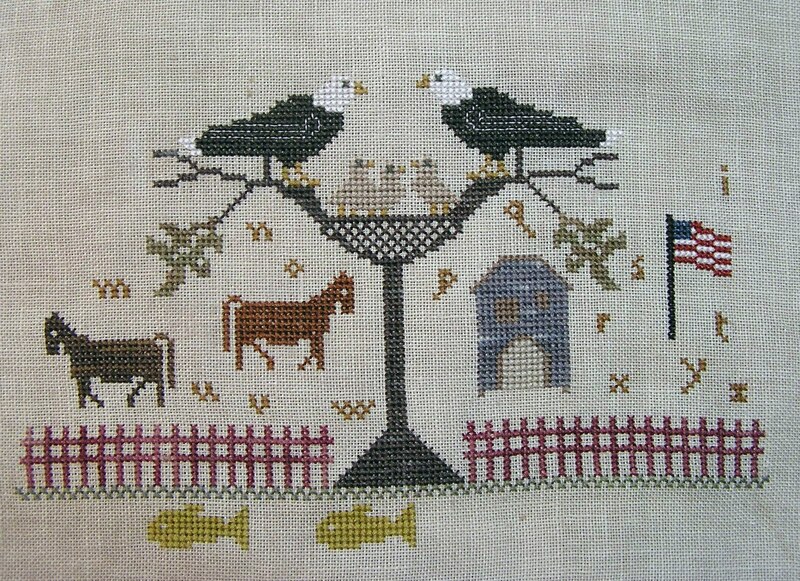 For those of you who want to be included in this weeks SOAR STITCH A LONG, please have photos emailed to me at order@countrystitchesonline.com (subject: soar sal) by 9:00PM CST this evening. The WIP photos of the Soar Samplers will be posted in Friday's post. Also on a sad note, I've heard via the grapevine that there has been tragedy at the eagles nest in Norfolk, VA. Mom eagle was killed by a plane hit. The nest there, I understand, is near the airport. What I've heard is that they have rescued the young and they will be raised in a rehabilitation center of some sorts and then be released when they are ready. I feel so badly for the dad eagle, he not only lost his mate for life, but his little ones as well. For those of us who have been following the Decorah, IA eagle family we know that as big and mighty as these birds are, tragedy can strike at any moment. Our dad eagle lost his first mate as well, momma eagle is his second mate. If you haven't watched the PBS documentary, American Eagle yet, I urge you to take some time to do so. It documents the Iowa eagles, the loss of his first mate and the courting of a new mate...the eagle as we know today, as our momma eagle. It is a beautiful love story, really. It's been awhile since my son, Matthew has filled in as guest blogger. Why he's even taken up a new craft since we've seen him last...he's been bitten by the crafting bug! 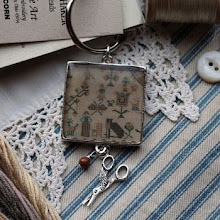 He now spends his free time tying knots, playing with thread and pretty little scissors! 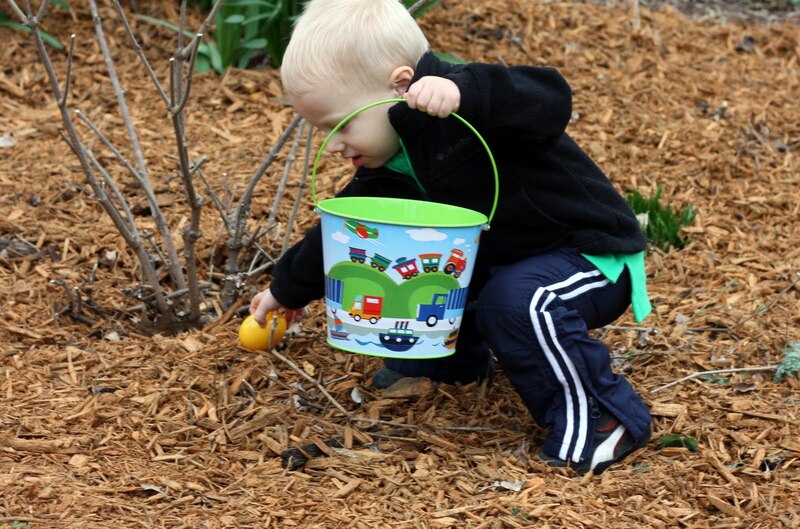 So without further ado, I'd like to present today's guest blogger Matthew. Guest Blogger :) This time please edit my typos for real. You are going to have to edit some of the pictures. it was pretty hard holding a card for the background and taking pics at the same time. 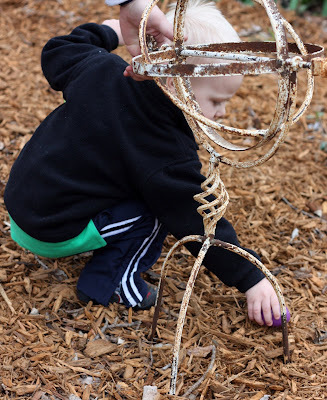 Mom here - you are finding out, this being a blogger isn't easy stuff!! Hello ladies (don't you love it that he assumes only ladies read blogs)its been a while since i guest blogged and since crafting runs in my blood i picked up a little something. I'm not talking about making a quilt or sewing a button on my shirt (although i had to teach myself how to do that in preparation for my last interview). 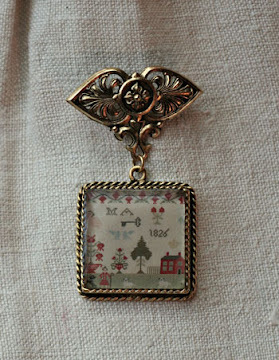 Sweet, I think now both of my children know how to sew on a button...wonder if they could teach their father! I'm talking about real crafts. The art of tying a fly. 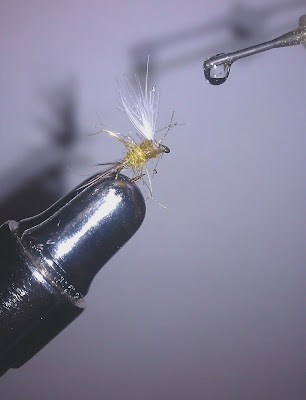 I feel just like my mother when I'm tying flies. The entire living room is full of stuff piled up all over the place. Shhhh....you aren't supposed to tell people that I'm a messy when I craft!!! How embarrasing... A pile of feathers and peacock hearl over here, a stash of string over there, and a nice scissors in the middle. You better keep an eye on those scissors, you know how your mother loves cute little scissors....and those are lookin pretty cute to me! The only thing im missing is a cat chasing around my thread. 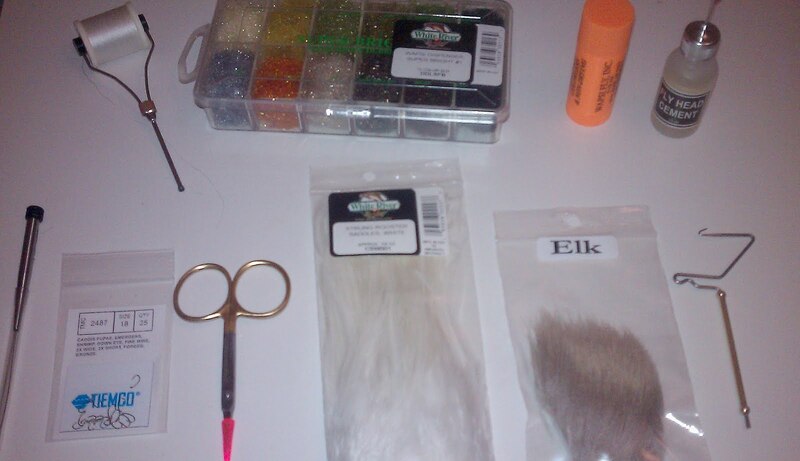 Here are the supplies needed for the fly. 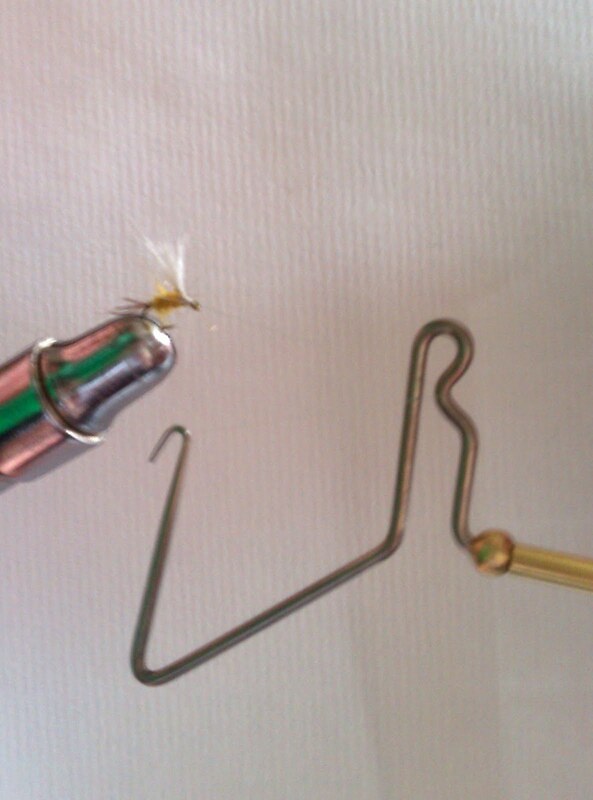 The type of fly I'm going to show you is a version of an Adams Parachute Fly. This type fly is a dry fly and it is intended to float ontop of the surface while fishing. First you must begin with a hook in the vise. The hook I'm using is a size 18. 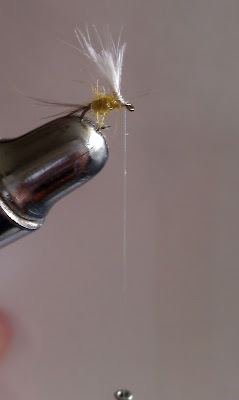 Once the hook is secure on the vice you start wrapping your thread and i choose a 70 Denier White flymaster 6/0 waxed thread (gosh i feel like my mother right there) He even waxes his thread...jeepers I taught him so well! 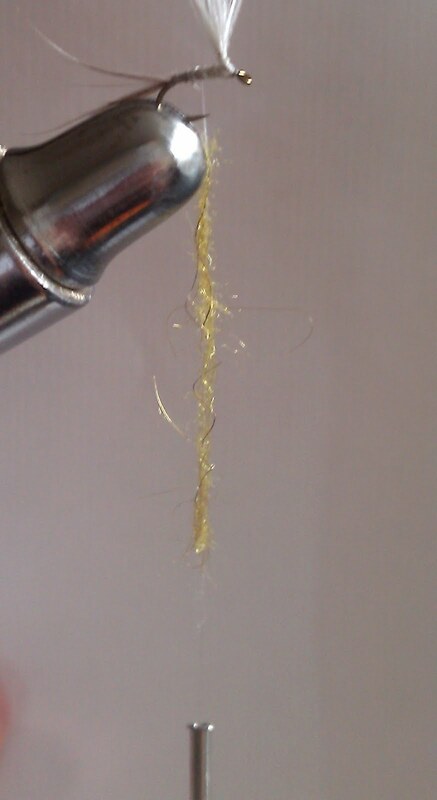 After wrapping the thread and clipping the loose end its time to wrap it back towards the hook. 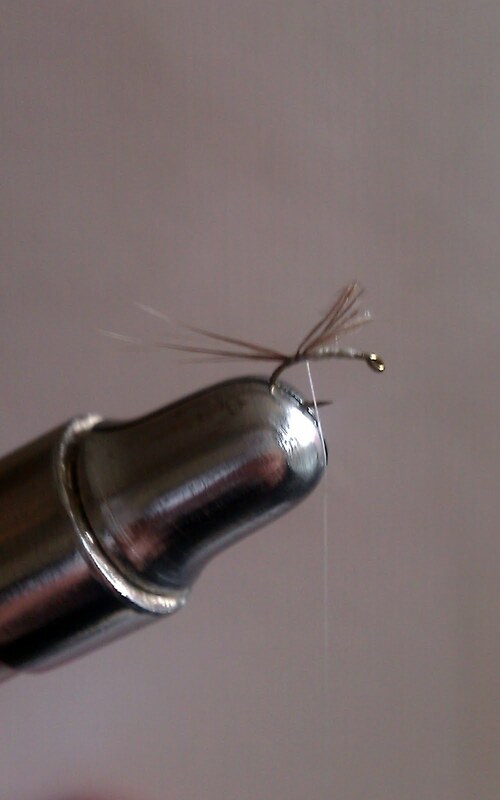 Once its towards the back of the hook we need to tie in the buck hair that is going to simulate the tail of the fly. A buck, as in a deer? Poor deer. 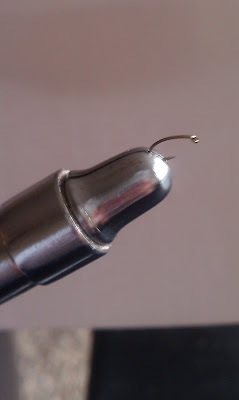 After the buck hair has been wrapped tightly you need to move the thread to the front 1/3 of the hook. Once the thread is in the right position, take about 6 fibers of White rooster saddle and tie it in the middle. Rooster, as in chicken rooster? Poor rooster! 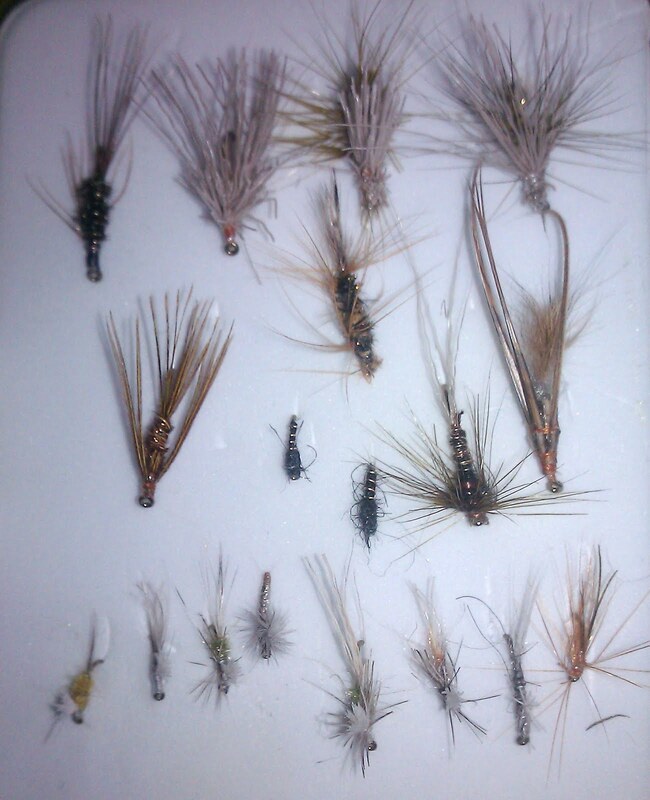 Now its time to add dubbing to simulate the body of the fly. 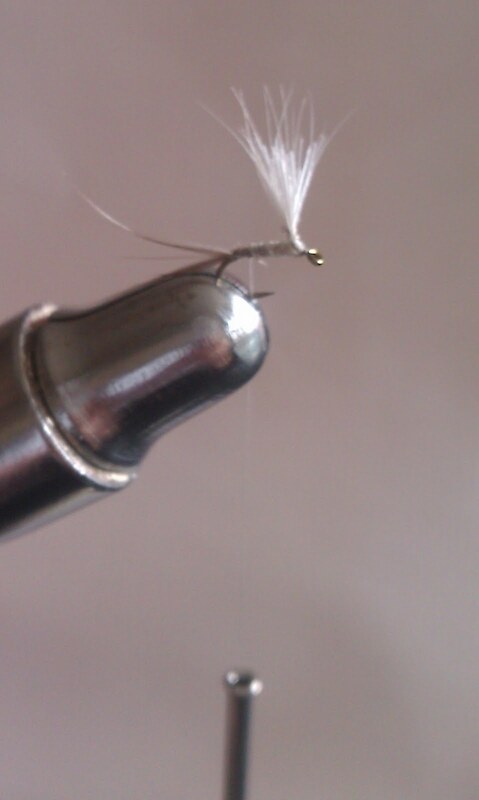 dubbing consist of little bits of stringy looking stuff that reminds me of stuffing that you crafty ladies use. I choose an olive dubbing as the trout seem to like anything olive colored early in the season. I waxed the thread so the dubbing would stick nice and good. Now that the thread is covered in dubbing its time to create the body. 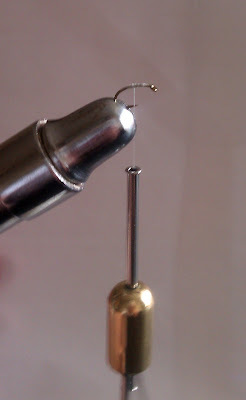 Now bring the thread to the front of the hook leaving a little bit of room for a finishing knot. Using a whip finisher (basically a fancy tool for lazy people) we create a bunch of knots so our fly doesn't fall apart and clip the string. Time to secure the line with a drop of head cement. Time to give this guy a little hair cut and here is the finished product. Isn't that a cute little hair cut...reminds his mother of the hair cut he gave himself when he was a little tyke. He had about that amount of bangs left...one tuft! Here is how big the fly is compared to a penny. 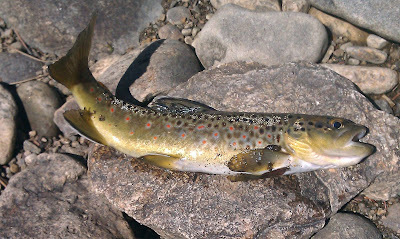 Seems crazy that these fish can actually see these little things in a river but trust me they can see them somehow. So that is how you tie a fly. 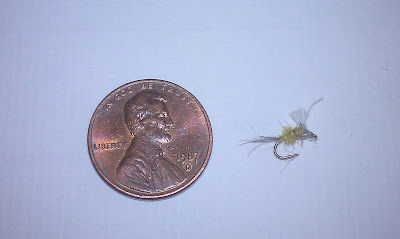 This fly is suppose to simulate what a mayfly hatch would look like. No actual insect parts were used. My mom thought you catch a house fly and glue it onto a hook when i started my fly tying adventure. Silly Minnesooota people. 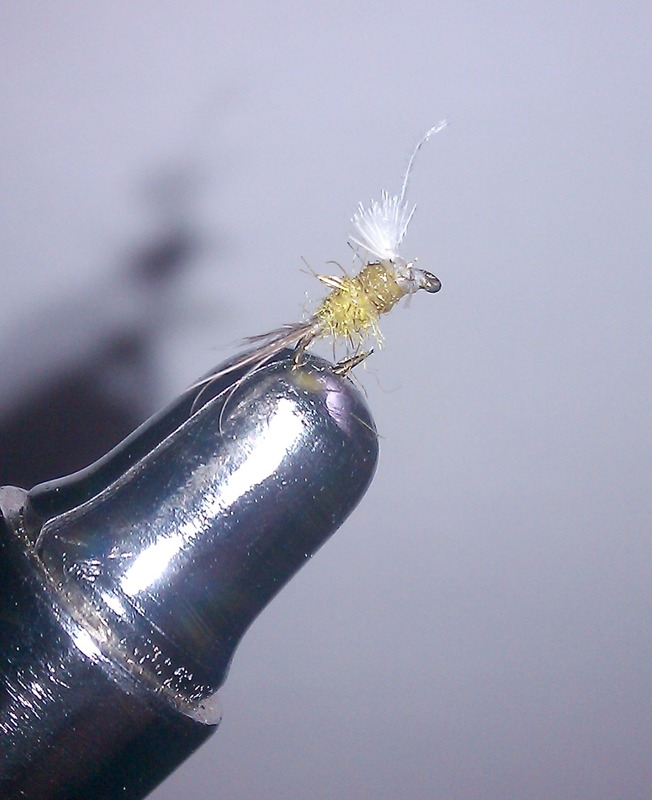 I still think there are people out there that tie real flies to their lines...that's my story and I'm stickin to it, ya, you betcha! Isn't that how they catch lutafisk??? 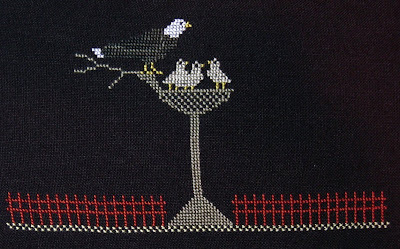 Why is it that the male figures in my family poke fun at me because I watch the eagle web cam? I'm pretty sure that my dh is watching the eagle cam at night, after I go to bed...he just won't fess up to it! 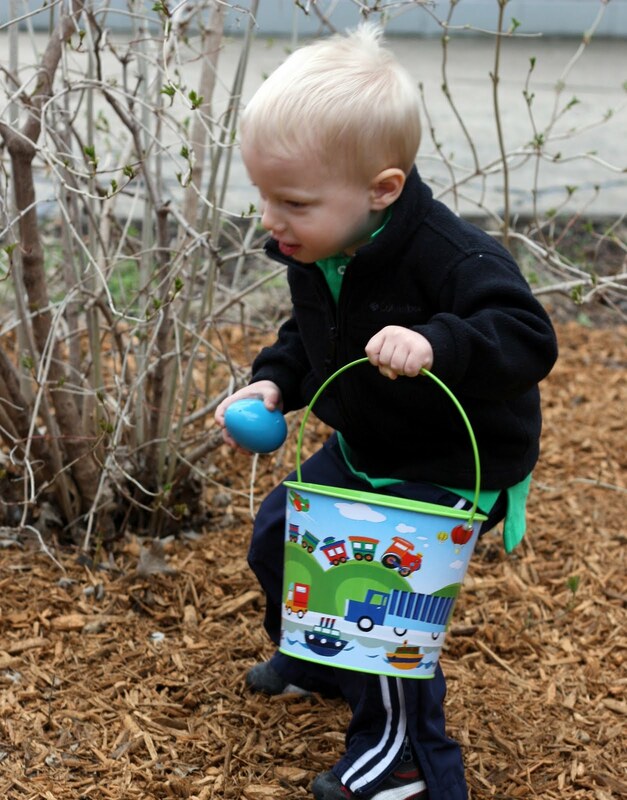 During nap-time the Easter Bunny came to Grandma B's house. 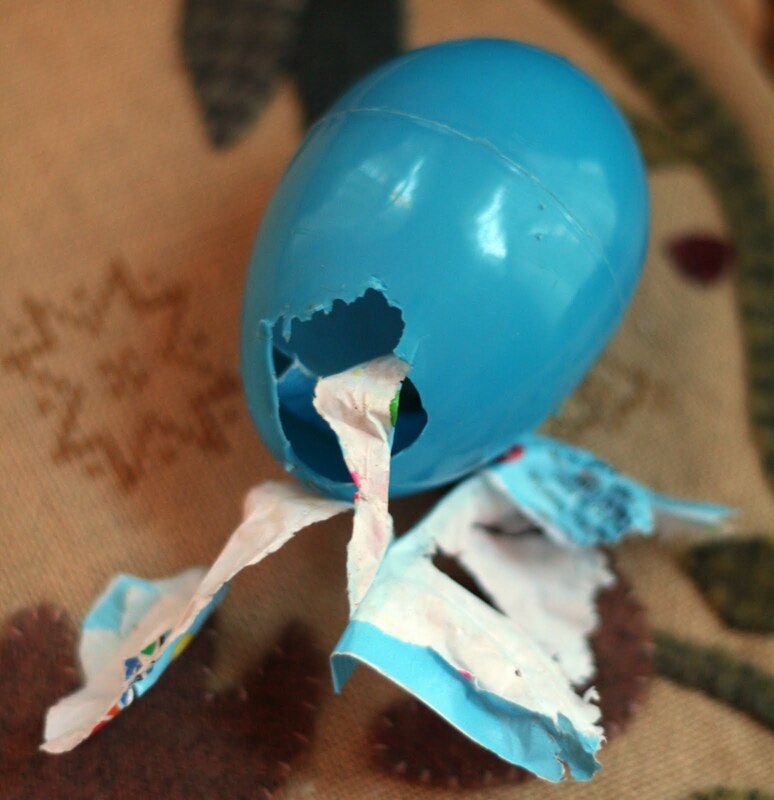 There were 12 eggs in all. we could only find 11. Hmmmm...where is the 12th egg? 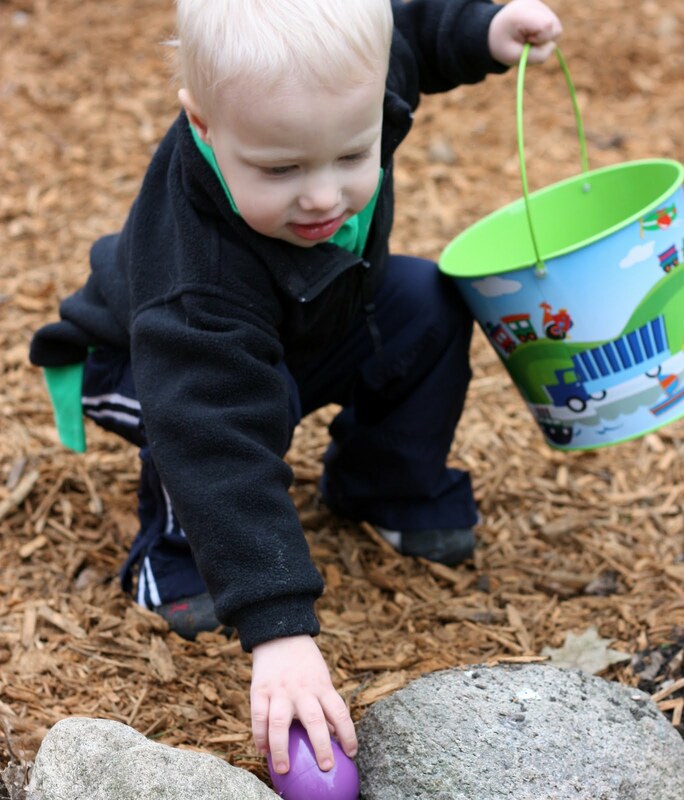 The egg that got away! 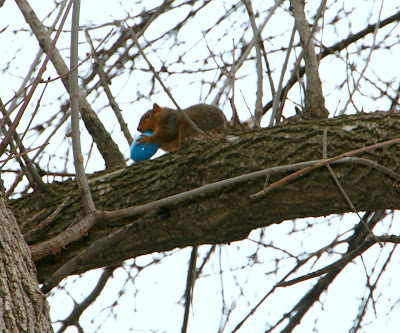 Question of the day...do squirrels get sick when they eat chocolate???? 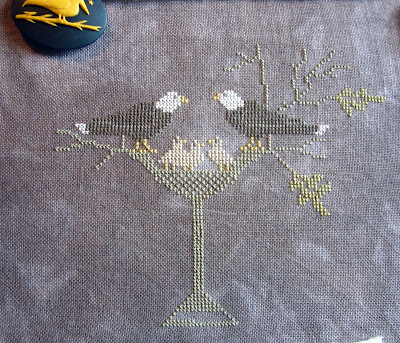 Barb just started her Soar sampler on Saturday evening, here is her progress to date. She used some linen in her stash, a 28 count R&R linen. She is uncertain of the colors name, it appears from her photo that it is a grayish black. 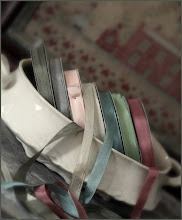 She is using Weeks Dye Works, Crescent Colours and Gentle Arts hand dyed flosses. 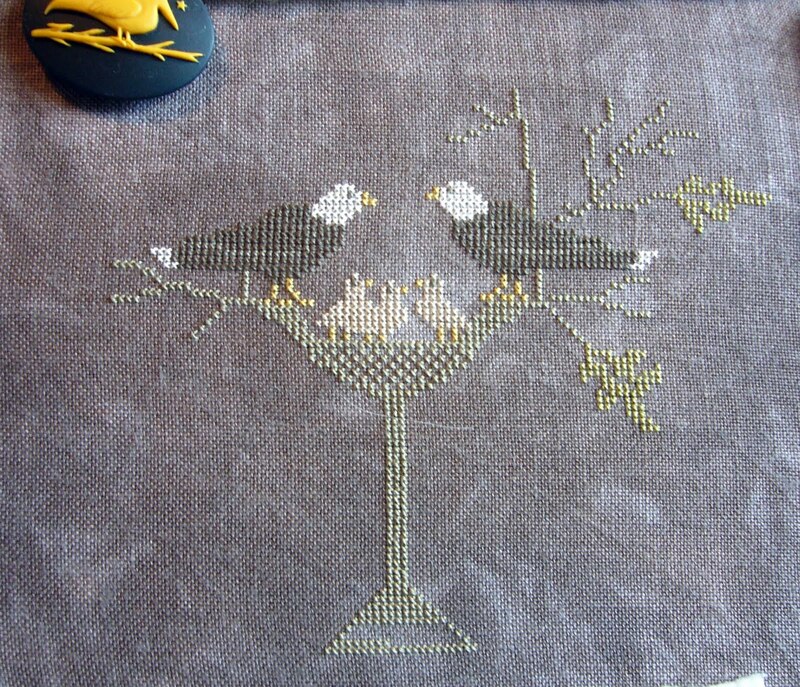 I think her choice of grayish toned linen is so fitting for this piece, as we all know what the skies have looked like here in Iowa for this poor eagle family...cold, wet, snowy & dreary. 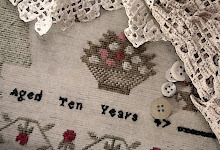 You can visit Barb's blog here. 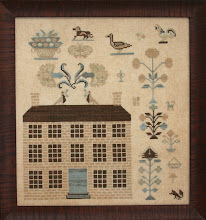 Judy from Attic Raggedy's has chosen to work her sampler on 28 count Dirty Cashel linen. She is using 2 strands of DMC flosses over 2 threads. She did have to change some of the floss colors to get necessary contrast between motif and linen. Her floss changes thus far are, DMC 3866 to 3782 and DMC 610 to 640. Judy to is a blogger, visit her here. When I designed this piece I was teetering back and forth, black linen or a dirty tan linen, so I'm glad someone has chosen to go this route...now I'll get to see it both ways with only having to stitch it one time!! Paula doesn't have a blog, but hopes to venture into that someday soon. And last but not least...another Soar SAL member hailing from Iowa! Have I mentioned that we Iowans are pretty proud of our famous eaglet family?? Below is Harriet's work in progress. She was introduced to the eagle web cam first here on my blog. Since then she has shared the link with several people, even the plumber that happened to be working at her home. The plumber later mentioned that his children are having fun watching the eagles. 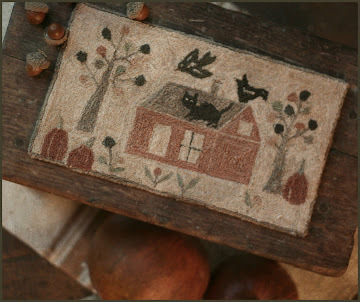 Harriet didn't have any black linen in her stash so she selected something she did have. 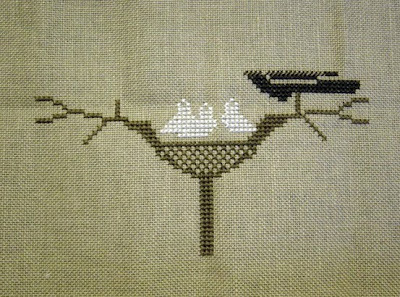 She is stitching on Silkweaver Thunderstorm 32 count, using 2 strands over 2 threads using all DMC flosses so far except for the granary. She wanted the granary to look like an old red barn, so she switched out a couple of DMC flosses to HDF Examplar Raisin Wine and Examplar Hearthstone. She uses 1 strand over 2 in the silks. I'd like to thank the above ladies who have shared their work with me, so that I can pass it on to all of you. 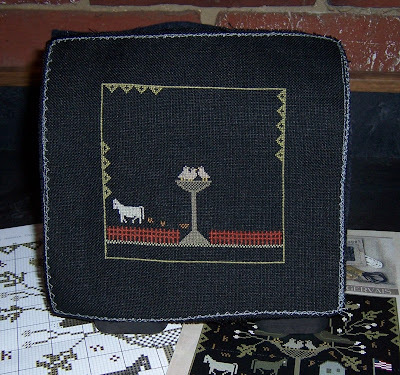 It's been so fun getting photos of your work and seeing what choices of linen and threads you have come up with. Remember you are welcome to jump in at any time! Digital photos of your WIP just need to be to me by 9:00 PM CST on Thursday evening to make it into the Friday morning post. 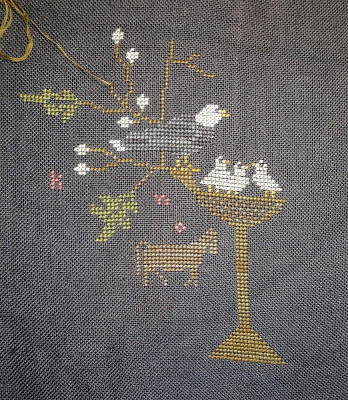 You can email me your photos at order@countrystitchesonline.com, putting Soar SAL as it's subject. 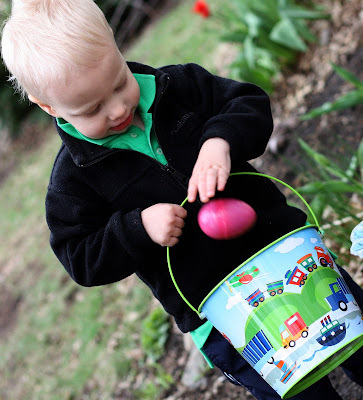 Wow, it's hard to believe it is the Friday before Easter! Didn't we just have snow on the ground a day or two ago??? I'm taking the day off today as family is arriving later this afternoon, and... well let's just say Grandma has lots and lots to do before the Easter bunny comes!! I keep forgetting to mention that I've received a couple of emails from Bob Anderson (Raptor Bob), the guy behind the eagle cam. 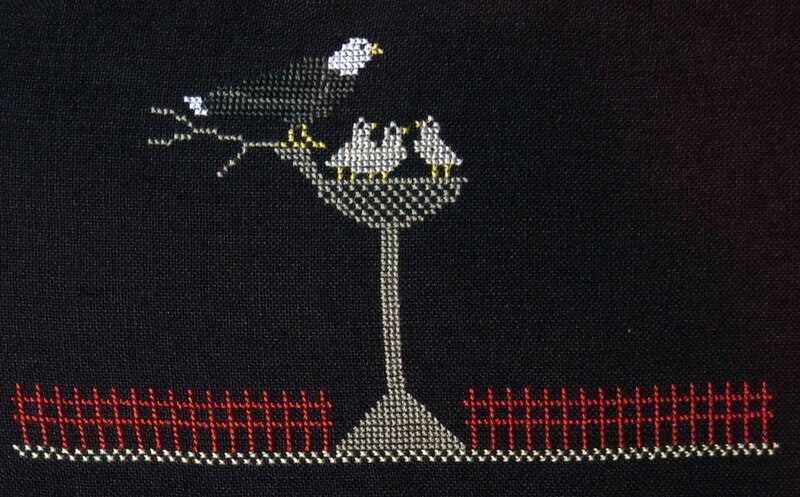 He sends his many thanks for the donations that I have made through the help of you, who have purchased the Soar pattern. I'd like to say "Thank You" to all of you who have made this possible for me. We are approaching the $1000.00 donation mark, thanks to you all! I'd also like to share a newspaper article about this man, Bob Anderson...he is so much more then just a guy that loves eagles...his love of nature is just amazing! Here is the newspaper article link for your reading pleasure. 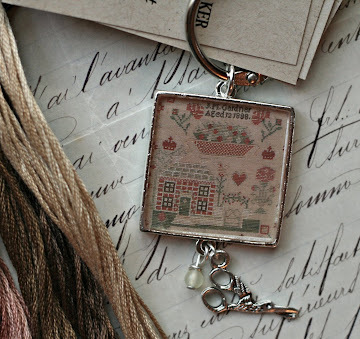 The photos of WIP's are beginning to trickle into my inbox, tis so fun to see other peoples work! To be included in tomorrow's blog posting for this SAL, I ask that you have your digital photos emailed to me by 9:00PM CST today. I've got the eagle web cam on as I type, the bird's are chirping, the sun is peaking out, it looks to be a nice sunny spring day for our little eaglets. They are growing amazingly fast. I think there are going to be a few empty nesters when they take flight come July...I know one for sure. I'll tell you the good stuff first! 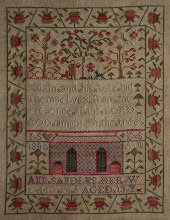 Ann Sandles pattern is done and has now been posted onto our website for purchase. Isn't she lovely? 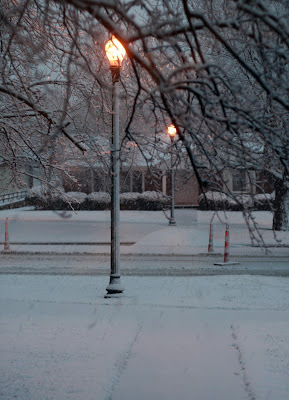 Springtime in Iowa, gotta luv it, don't ya??!!! And those orange and white cones...that is what we call Iowa's 5th season...road construction. 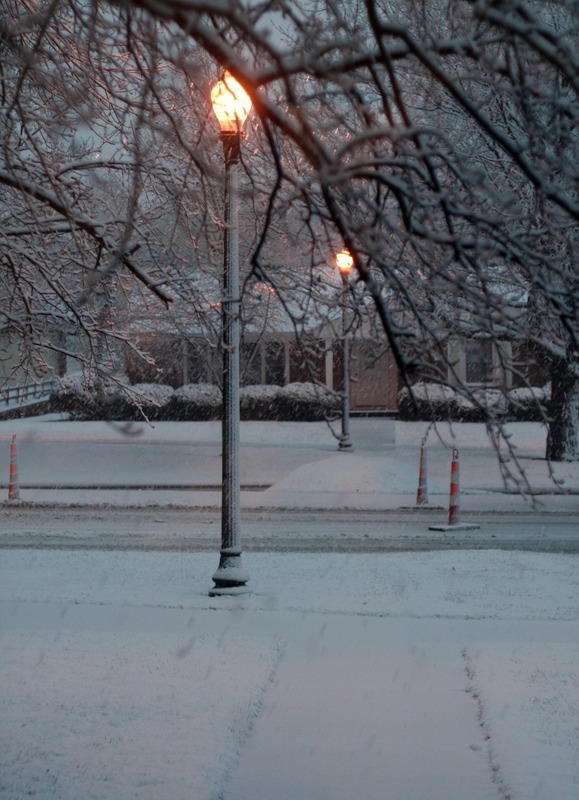 Yep, gonna be right outside my door for most of the summer...lovely. 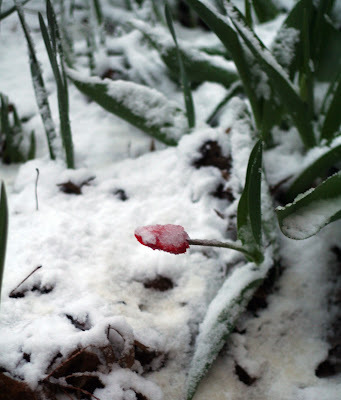 And my poor tulip bed this morning...do I pick them or leave them??? 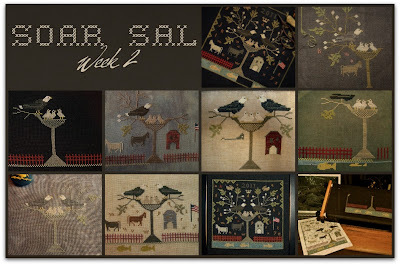 Today marks the kick-off of the "Soar Sampler" stitch-a-long! 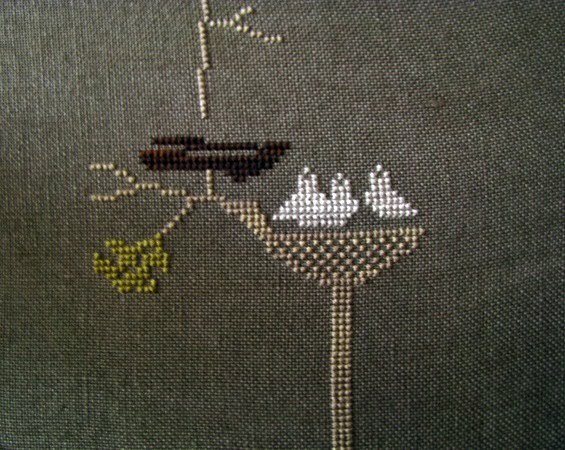 I'll start posting pictures of works-in-progress on this Friday...so start stitcin' and sendin' pictures folks! 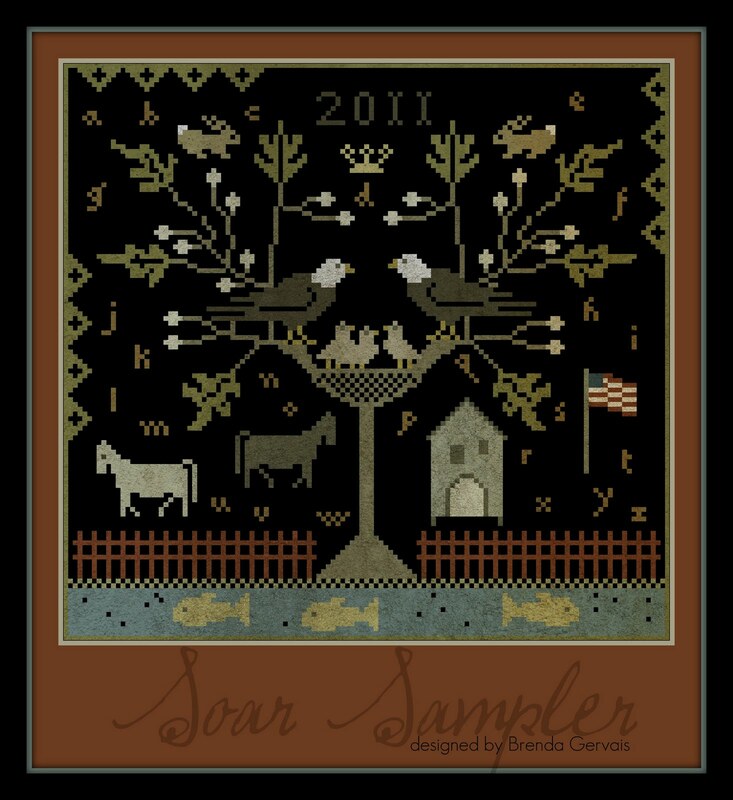 Send me one digital photo per week of your WIP to order@countrystitchesonline.com, putting Soar Sampler in the subject line, please. Also mention what count/color/brand linen you are using. 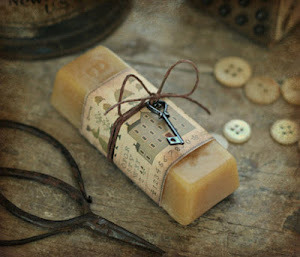 If you are using hand-dyed flosses tell us that too! 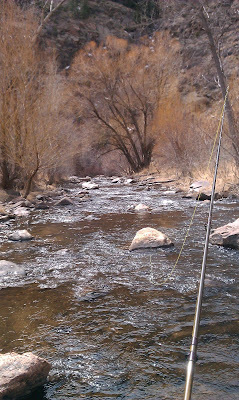 If you are a blogger and blogging about your WIP, pass that on and I'll post that along with your pics as well. 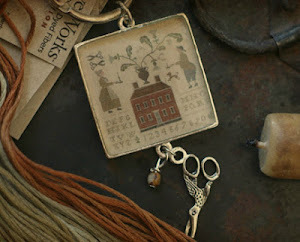 A little about my piece... I am using Onyx 30 count linen and working over 2 threads, using 2 strands of DMC flosses. 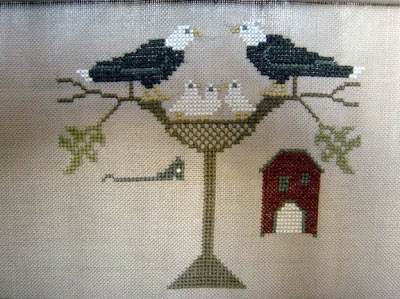 I'm finding this sampler to be a relatively quick stitch...thinking I might get it done in 2 - 3 weeks of weekend stitching. Also... wanted to share this history lesson with you all, compliments to one of my readers who pointed this out to me. She felt today was a very appropriate day for this patriotic sampler SAL event to begin. She reminded me that today is Patriot's Day. On this very day in 1775 Paul Revere made his famous ride to Lexington to warn Samuel Adams and John Hancock that their lives might be in danger. The Boston Marathon runs today as well, coinciding with this historical event. 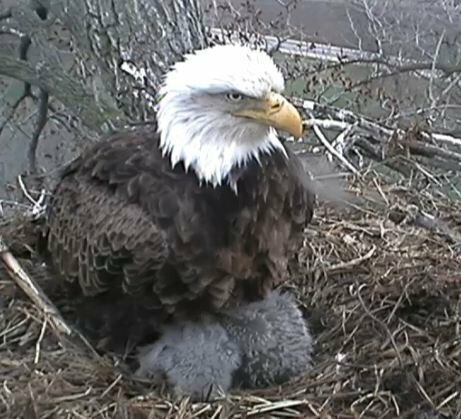 Just in case you haven't visited the eagle cam lately...Momma got a new pair of eagle slippers!! Our ice cream treats growing up as kids weren't on sticks. 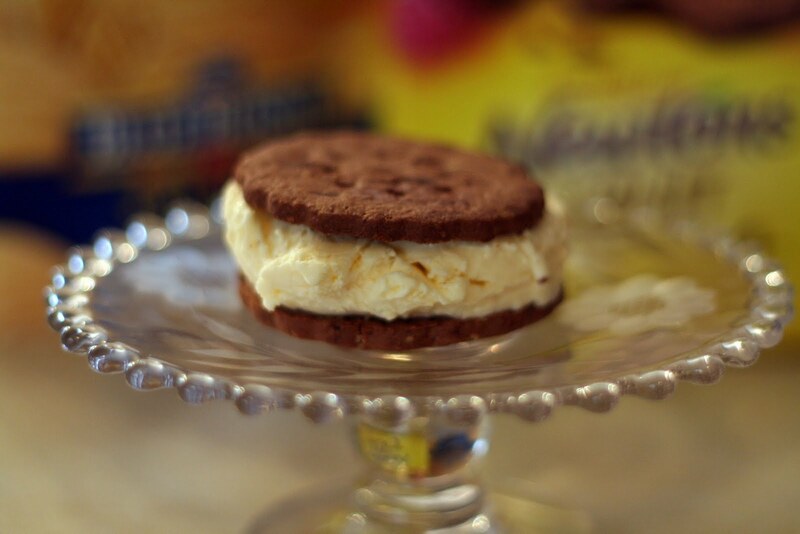 Instead Mom would get out the 5 gallon tin of Schwan's Ice Cream and put a scoop of ice cream between two graham crackers...these were our ice cream treats and I l.o.v.e.d. them! About the time my kids were little ones, the cinnamon graham cracker came into existence and just that little bit of cinnamon made this ice cream treat about 10 times better... an ice cream treat enjoyed by my kids, and well...me too!! Now I know... I'm getting too old to need ice cream treats, but while doing my grocery shopping this week I stumbled upon a new cookie. 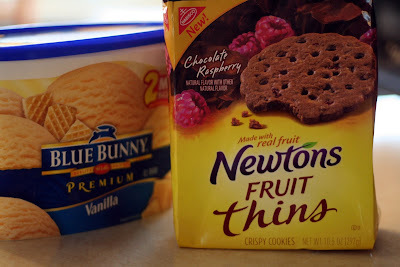 I saw the word Newtons on the packaging and I immediately thought, ISH! Did your Mom buy Fig Newton cookies? Did you like them as a kid? Do you like them as an adult? 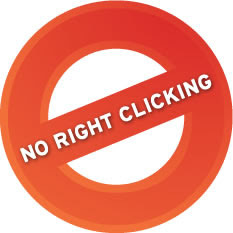 Yes, No, No....right?? ?